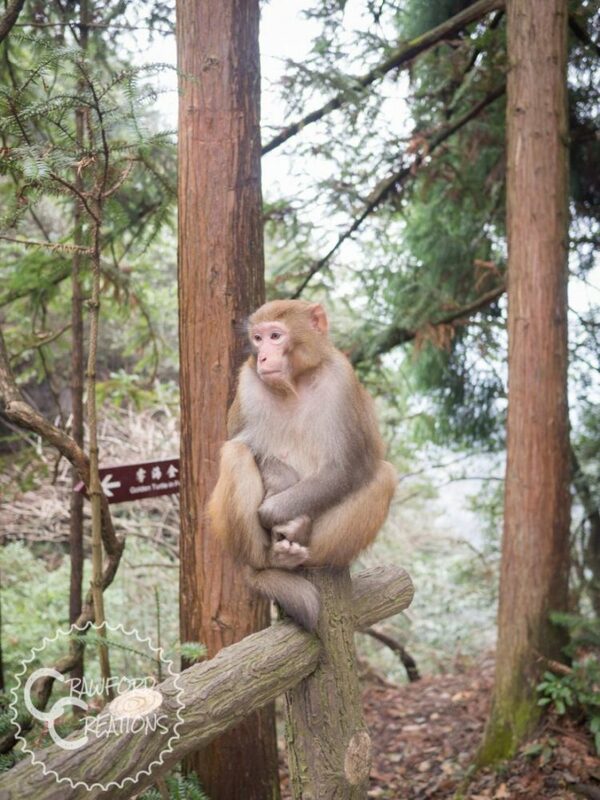 Wulingyuan Scenic Area is a UNESCO World Heritage Site approximately 40km from Zhangjiajie City. Home to the famous finger mountains that inspired the scenery in the movie Avatar, the scenic area spans an impressive 264 square kilometers containing more than 3000 rock pillars, two natural bridges, approximately 40 caves and an abundance of food stealing wild monkeys. 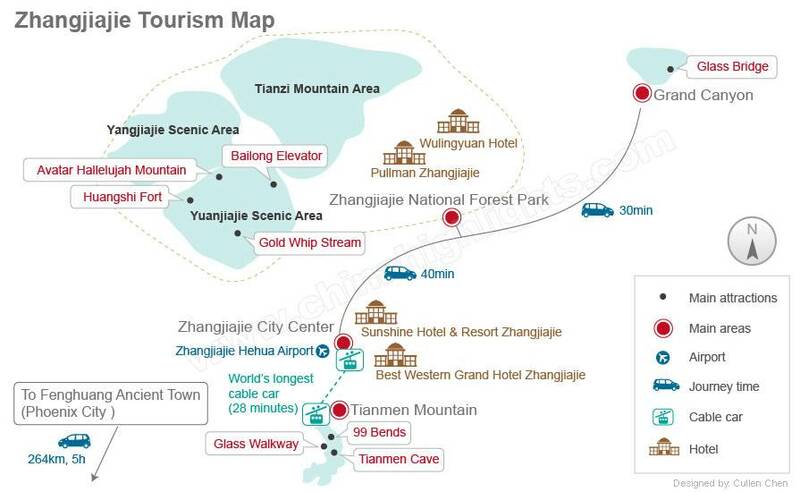 Wulingyuan is divided into 4 areas: Zhangjiajie National Forest Park, Yuanjiajie Scenic Area, Tianzi Mountain Nature Reserve, and Yangjiajie Scenic Area, each it’s own national park. The scenic area also includes the remaining attractions of Zhangjiajie Grand Canyon, Yellow Dragon Cave, and Baofeng Lake, although they are in a separate area and have their own entrance fees so I’ll talk about them separately. 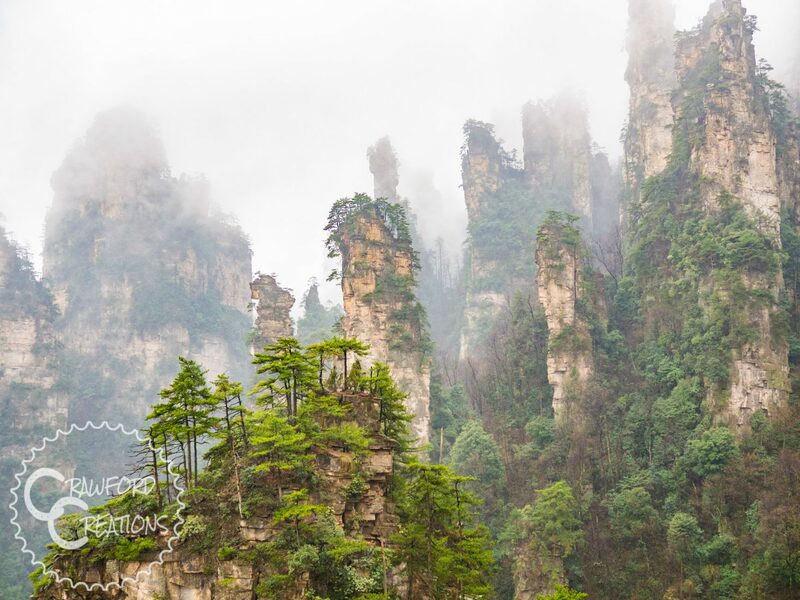 Unlike the limestone peaks of Tianmen Mountain in Zhangjiajie city, the “Hallelujah Mountains” of Wulingyuan are composed of sandstone, a rock that erodes much more quickly over time. Over many thousands of years, strong winds and rain have whittled away at the sides of the mountains creating the unique finger-like projections we come to marvel at today. 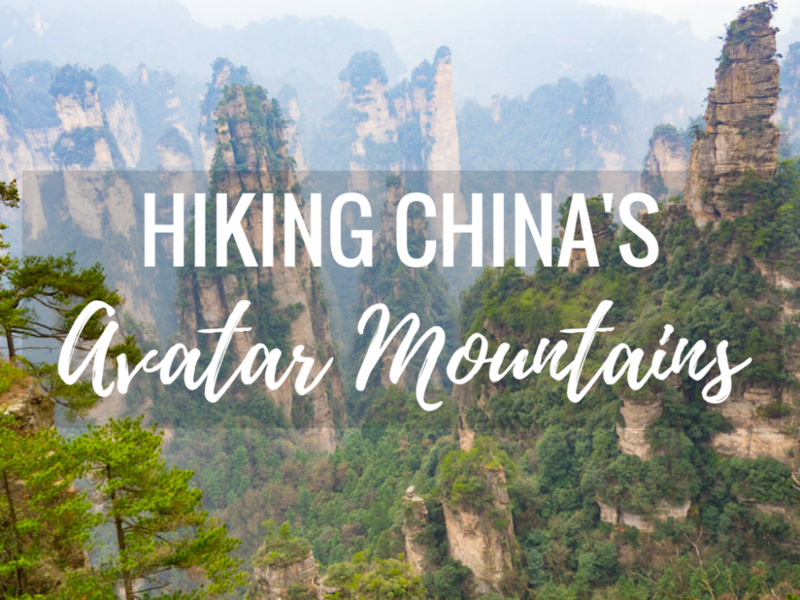 The scenic area consists of many stone hiking paths and countless thousands of steps for those whom the physical effort of climbing to the top of the mountain step by step makes the views from the top even more spectacular. 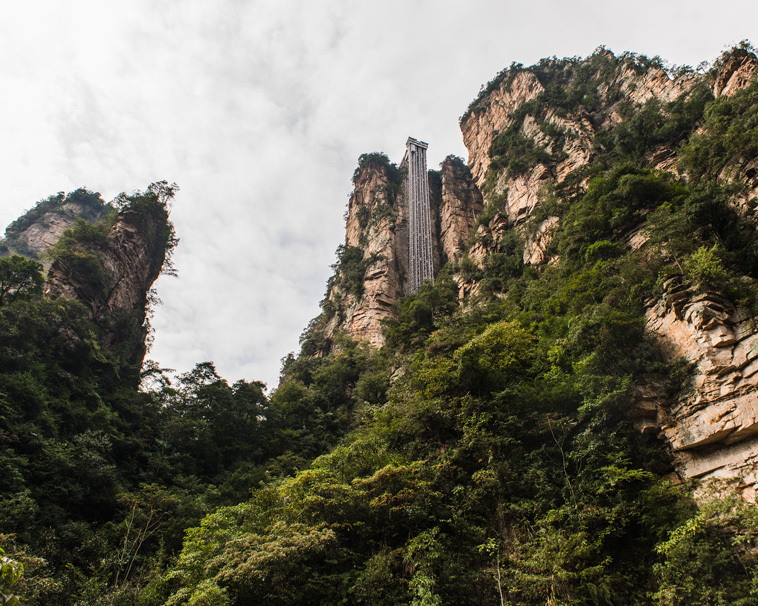 For those less physically inclined you can take one of the many cable cars to the mountain tops, or hop in the Bailong Elevator, an impressive 335-meter tall elevator built into the side of the mountain in Yuanjiajie Scenic Area. While the elevator’s glass carts offer scenic views during your two-minute ride up the side of the mountain, the often two-hour long wait to ride in the elevator during peak season makes the views hardly worth it. The ride will not only take up a good chunk of your time but at 72rmb one way it will take a chunk out of your wallet as well. 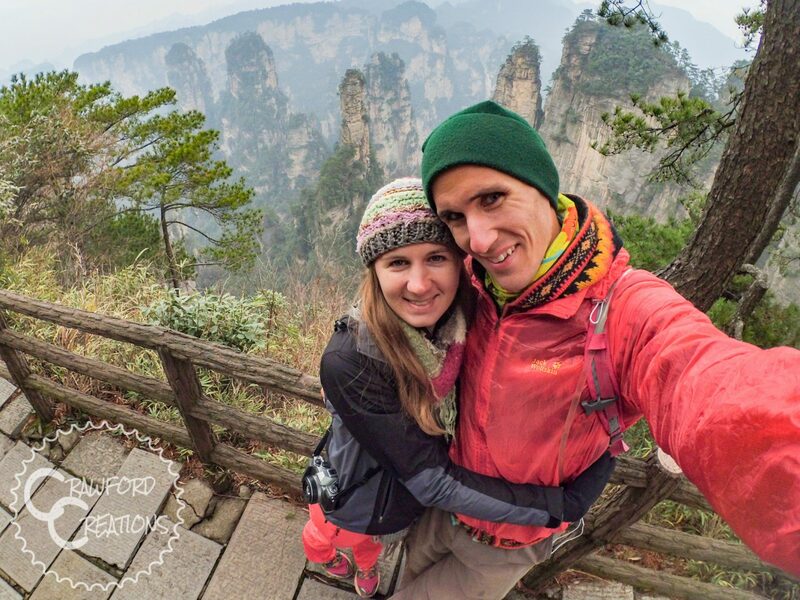 We made it to both Zhangjiajie National Forest Park and Tianzi Mountain Nature Reserve on our trip, reserving one day for each section we hiked. Image of the Bailong Elevator by China Nomads. In Zhangjiajie National Forest Park lies Huangshizhai, which translates to Yellow Stone Village, a small collection of houses set on top of one of the columns with a mountaintop expansive enough to support the construction of a village and hiking path. From the edge, at any point around Huangshizhai there are 180 to 360-degree views of the impressive array of rock columns shooting up towards the sky. Hiking to the top of Huangshizhai is approximately a 12km long hike (one way) and takes 1-2 hours depending on your walking speed and how many times you stop to take pictures (which, if you’re like us is a lot). You can also opt to take the cable car for an extra fee of 72 RMB if you don’t want to hike both ways, or at all. To start the hike, enter the park and take one of the free buses to the 水绕四门 (shui rao si men) bus stop, near the Bai Long Elevator and Golden Whip Stream. From there you will take the main path winding along Golden Whip Stream for about 7km where you will get to a parking lot area with some restaurants. Here the path diverges, and you’ll want to take the stairs up the mountain (if you’re confused just ask for Huangshizhai and someone will point you in the right direction). After climbing some 3000 steps and passing by many monkeys, you will emerge on the mountaintop, and immediately realize that your burning legs, pounding heart, and breathless lungs are completely worth it. You can’t escape the views of thousands of sandstone pillars even if you tried. Every few meters there is another lookout that will completely take your breath away. We never once put our camera down the whole walk along the perimeter of the mountaintop. It truly is a scene straight out of the movie Avatar. The path around Huangshizhai is 4-5 km in length and mostly flat, a relief after the never-ending staircase climbed to get there. After walking the length of the hiking trail around the mountaintop, we headed back down the stairs the way we came, although if you don’t feel like walking (understandable after the hike it took to get up there) the cable car is a much less strenuous option for your descent. Not even the dreary weather could keep our smiles at bay with views like these at Huangshizhai. At 1262 meters tall, Tianzi Mountain is the tallest mountain in this section of Wulingyuan Scenic Area, offering spectacular views of the surrounding peaks, when they’re not trapped in the clouds that is. The hike to the top is approximately a 7km walk including another couple thousand stairs climbed in addition to Huangshizhai. The walk will take 1-2 hours, and is supposed to yield spectacular views from the summit. Unfortunately, we saw no such thing during our hike as the entire mountain top was shrouded in clouds so thick all you could see around you was a wall of white. To start your hike take the free shuttle bus from the park entrance to the 十里画廊 (shi li hua lang) bus stop. From here you can either walk the 7km of path and steps (there is only one path so no confusion there) or take the cable car to the top of the mountain for an extra fee of 67rmb (price depends on the season but will be around this amount). Tianzi Mountain Nature Reserve, Wulingyuan Scenic Area. Our only view was from the cable car on the way down from Tianzi Mountain. Wulingyuan Scenic Area is the only place where you can see the famous “Avatar Mountains”. These finger-like projections resembling nature’s version of a skyscraper will transport you into another world, an experience so unique it simply can’t be missed! 1. Fly into Zhangjiajie Airport (Hehua Airport) from any of the major cities in China. The airport is just 4km from Zhangjiajie city. Zhangjiajie Hehua Airport sometimes comes up as Dayong Airport when you search flights. Not to worry, this is just the old name of the airport. It is still the same place. Check the latest prices and flight times here. 2. Wulingyuan Scenic Area is located 40km away from Zhangjiajie City. Minibuses wait at the bus station in Zhangjiajie to take passengers to Wulingyuan Village. Buses run from approximately 8:00 am – 6:00 pm and cost 10rmb. If you can’t make it during those times or don’t want to take the bus you can take a taxi for 100rmb. You will have to negotiate for this price, but you shouldn’t pay more than that for the trip. Minibuses can be found to the left of the waiting area at the bus station. If need be you can ask the lady at the ticket window and she will point you in the right direction. You will NOT be buying a ticket at the window, simply pay the driver once you are on the bus (someone will come around asking for money). To hike the Avatar Mountains stay in Wulingyuan Village, the town just outside of the park entrance. Filter your search in Agoda to narrow the results down to only hotels in Wulingyuan. Check the latest prices and availability here. Tickets are good for 4 days in the park and include access to FREE buses inside of the park that will take you to the entrances of all the different park areas. A map of the park is extremely helpful to learn the names of the bus stops, as they do not correspond with the names of the mountains or areas of the park. Your accommodation should be able to provide you with one or you can buy one in the park. 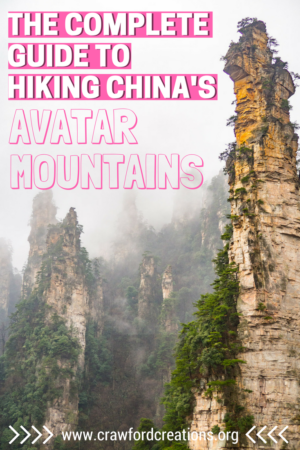 Have you hiked Wulingyuan? Are you planning to? Let us know your thoughts in the comments. This was really helpful for planning my trip in June, especially the information about Huangshizhai, which not many people blog about! Hope I’ll be able to get as beautiful pics as you guys got! Thanks Annie! Glad you found it helpful. Huangshizhai is amazing!!! You’ll love it. Have a great trip! You’re very welcome! Zhangjiajie is such an incredible place. I hope you get there one day! I’m thoroughly amazed by the pictures, and still somewhat in disbelief. All this while, I thought that particular scene in Avatar was all CGI animation! I’ve been to China several times, especially Chengdu, since my work sometimes require me to go there. I usually stay in serviced apartments in the city, at Fraser Suites Chengdu, perhaps I could arrange for something like a 2-day trip out to Hunan province the next time I’m there. Thank you for sharing! Thanks so much! It is CGI, but it’s based on these mountains in China. Zhangjiajie is definitely worth a trip, even if you only have a couple of days as it’s really easy to see the mountains in a short amount of time. I hope you make the trip, it’s an amazing place! Your blog is fantastic! Thanks for the information, we’re planning on going in February any idea how crowded it will be? Also it sounds like we can get a room at that hotel get up early and just go for it no tour guide needed? ✈ This is a well-informed post. Thanks Codi! As long as you’re not traveling over Chinese New Year (February 4-10) it won’t be crowded at all. Correct, no need for a tour guide! Most hotels in the area can provide you with an English map of the park and the trails are well marked so you should be able to navigate yourself no problem. Have a great time!